Online Therapy is an attractive option for many people because it is so convenient. Research and personal experience shows that Online Psychotherapy can be very much more effective than traditional Office Sessions because people feel much more comfortable and at ease when conducting their session from their home. This is important. Online Mindfulness Therapy focuses on changing the way you relate to your emotions – from avoidance and resistance to acceptance and openness – this is essential for healing and lasting change. Fighting or avoiding painful emotions only makes things worse. Below are testimonials from actual clients who have worked with me via Online Skype Therapy sessions. I have indicated where they live, but for confidentiality reasons I cannot disclose their names. Privacy is an important consideration in psychotherapy, whether in-person or online. Most of the clients I work with notice dramatic improvements within 3-4 sessions. Mindfulness Therapy is generally much more efficient that older style “talk therapy” because it works on changing the underlying reactive processes that generate and feed anxiety, depression, anger, stress and addictions. “I can’t write enough how grateful I am that I had a chance to learn how to take control of my overwhelming OCD symptoms under the guidance of Peter. Let me begin by saying that my flareups is something that I was unsuccessfully dealing with for good 10 years of my life. My OCD was like a bully, it seemed like it always found the thing that would frighten me the most and just grasp onto it for weeks. Completely taking me away from my family, friends and everything I did and enjoyed. It went from me being unreasonably jealous and insecure in my relationships to health scares to harm thoughts to feelings that I was becoming psychotic and the last and most debilitating one – a fear of losing control and self harming. I had dozens of compulsions without realizing, my attention, short term memory and focus were nearly gone. For about 2 weeks before the initial session I felt depersonalized, derealized and anxious the whole time. My intrusive thoughts would preoccupy me for 95% of the time and I just felt like this time I really had to learn how to either control my emotions and not live inside my thoughts or go into the hospital and ask to be put on medication. Let me also add that never in my life would I consider “meditating” on my intrusive thoughts. After just three sessions with Peter my OCD’s strength was cut in half, and then a few more sessions – it no longer had control over me. Even if intrusive thoughts came back they did not cause any or very little anxiety. My sleep got 1000% better, appetite came back. With that being said I feel like I finally realized how to connect with my true self, became more social, emotionally available, friendly, compassionate, composed and just aware of my body and my feelings so much more than I ever did. The things that would make me upset, seem like such a non-significance now. “I have been dealing with highway driving anxiety for about 12 years. I has been truly painful as it has kept me from doing activities I love such as traveling for leisure and work, visiting friends, or doing local exploring. In the past, when getting on the highway I would break out into a sweat instantly and panic; not what anyone should be doing on a highway. For years I have been looking for solutions which I often stopped because I scared that I would have drive on the highway to solve my ‘problem’ and also embarrassed. I found Dr. Strong’s site via the internet and it has helped me incredibly. He has provided me with mindfulness tips and tools that are practical and have given me the confidence I needed to start driving on the highway. It is truly amazing what happens when you are my kind to yourself, your fears, and learn about your true self. In addition to decreasing my driving anxiety I have noticed that I am translating these learned skills to other areas of my life. “I had one skype session with Peter Strong and it has helped me heaps in my recovery. I am now trying to apply mindfulness in my everyday, whether I go back to depressive or anxious states, or whether I am feeling normal, mindfulness helps you view life in an easier, more adventurous way. It helps me enjoy life and flow with it. I realized that anxiety disorders and depression were not a disease that I needed to attack. I needed to change the way I reacted to my thoughts and emotions and view life in a different way.” – Carolina, Mexico City. “I have been suffering from severe depression and chronic anxiety for over a year now. In the pursuit to heal myself, I came across Peters work online. The insights I have gained from two Skype sessions with Peter, have put me onto a pathway healing and recovery. I am so grateful for Peter’s teaching and would recommend his service wholeheartedly.” – Lou, New Zealand. “I had been stuck in another bout of intense generalized anxiety for several months when I found Peter. His website states that people experience significant results after 3-4 sessions. Well, after just 2 sessions I was 80% back to normal. I realize now that so much of my anxiety has been contraction against thoughts, feelings and sensations. So Peter’s teaching me to welcome them and create a relationship with them was exactly the right “medicine” to bring me out of that contraction and back into the flow of my life. And a really wonderful thing is that I’m not afraid of the anxiety returning any more because now I know how to work with it. Beyond healing the anxiety, my whole inner landscape is changing. I’m learning that the self-criticism, shame and doubt I have been stuck in for so long can all be met with compassionate awareness and brought to resolution. I’m starting to feel the joy Peter talks about and a real tenderness toward myself and others. I have practiced working with difficult emotions with many wonderful Buddhist teachers, including Pema Chodron and Adyashanti. Peter taught me aspects and nuances that were completely new to me that are making a huge difference and allowing me to meet and heal these parts of myself more efficiently and actually with less distress. Sessions with Peter are enjoyable – he is kind and patient and gentle. I love that the understandings I’m gaining in the sessions not only help me to heal my emotions but also contribute so much to my spiritual path.” – Judith, California. “Hi Peter. I purposefully waited a few months to give you my review because I wanted to be sure it was something that was going to be lasting. And it sure is! I have been on anxiety and depression medications since my teenage years. I am now 32. The last 2 years after the birth of my second child have been extremely difficult, filled with such tremendous anxiety and depression that the medications were no longer helping. I came to Peter desperate, my last hope. I had tried other therapies that failed me: Peter’s approach is just what I needed. Instead of fighting the anxiety and trying to push it away or cover it up, you become conscious of it and give it the space that it needs. Eventually it dissipates. It sounds counter-intuitive, but it is the key… and it works! I am real proof. I am now happier and more content than I have ever been in my life. I am relating to everything in a more conscious and accepting way. Forcing solutions and trying to control did not work for me. I am no longer living in fear and desperation. Best investment I have ever made. Thank you Peter!” – A. CT USA. “I contacted Dr. Peter Strong as a last option to try therapy to save my crumbling career. I was unable to build or sustain working relationships with co-workers and was perceived as ‘difficult to work with’ by many. I was having a hard time lasting in any job. Working with Peter and learning his mindfulness techniques, I am able to see why I was going wrong. Further sessions helped me to learn how to handle daily events and cope with stress – turn from being reactive to responsive. I am much more in touch with myself and am not losing it over daily matters. Mindfulness therapy has helped me develop more awareness and this has brought so much ease in my relationships. My colleagues have started feeling comfortable working with me and I feel more capable of handling interactions at work. I SEE things clearly and know what to do without being reactive. As a bonus side effect, I also stopped binge eating due to extreme stress! My family relationships have improved. The past aggravations, disappointments do not have the same impact on me. I feel calm, capable and ready to take on each day and handle what comes my way with awareness. I am very grateful to Peter for all his help.” – MJ, Project Manager, Software Engineer, Florida, USA. “My sessions with Peter have been transformational, I suffered with depression for many years, when my father passed away and I was very low I found Peter’s website, I had visited another therapist on one occasion, however I did not get a good empathetic feeling. I then contacted Peter and we started to have therapy sessions via Skype. Peter is kind, I have worked with my feelings and now have less Skype sessions than I initially needed, I am happily married and have a lovely dog and a beautiful home, none of this would have happened if I had not taken that big step and chosen to have therapy, it is a really hard step to take but it is the best thing I ever did, I would rather spend money on a session with Peter than buy a new top, although both if I can afford it! I see Peter less now, however if I do get a lull then Peter helps me to get back on my feet very quickly feeling alive and happy again, thank you Peter for all you have done for me.” – Gail, Brentwood, England. “I changed more after 2 weeks of online counseling than after 2 years of talking therapy. My anxiety used to affect every part of my life. Now I feel alive again and enjoy life so much more. I thoroughly recommend this mindfulness therapy to anyone looking for treatment for anxiety or depression.” – London, UK. “The insights that I have gained in the first two sessions of online counseling are proving invaluable. Now I can see a way through my anxiety for the first time. Mindfulness Therapy is amazing.” – San Francisco. “I really don’t want to continue taking medications to treat my anxiety. I hate the side-effects. I feel that this online counseling has given me the tools I needed to stop my panic attacks. Mindfulness therapy has been very effective treatment for me – and enjoyable too!” – Los Angeles, USA. “Mindfulness therapy has helped me with my anxiety in a very significant way. No longer am I bound to my anxiety in a continuous circle. I’ve been able to see my anxiety for what it truly is, and it has liberated me. Thank you Peter.” – Toronto, Canada. “I had suffered from anxiety and depression for a long time and have tried different things like seeing a psychologist, taking medicine, taking herbal medicine, exercises like yoga. But these things never worked for me because they never taught me how to actually think in a healthy way. With mindfulness therapy I was able to analyze my thoughts and make them into something organized and concrete. In this way I could better fully understand them and then let them pass on. I didn’t feel like my thoughts were stuck inside of me festering. I was no longer fighting with myself. It was refreshing to learn how to accept every part of myself. The positive thoughts as well as the negative thoughts. I really recommend this for everyone. You can really see the results quickly. I only wish that I had known about this earlier.” – Tokyo, Japan. “After only three sessions my anxiety had greatly diminished. After five sessions I am now having days where I feel completely like my old self-again; it is complete Bliss! This teaching truly makes sense on such a spiritual level, I now know I am going to overcome this and am on the path to complete recovery. I am so grateful for finding Peter! Thank-you so much!” – Ontario, Canada. “I am the Director of Behavioral Health Social Work Services for a major northeast hospital network and have been working with Dr. Strong via Skype for about six months. As a seasoned clinician and administrator who has both provided and been a consumer of therapeutic services over the course of decades, I was initially skeptical about whether Dr. Strong’s methods and his use of the internet as a medium would work for me. At this time of my life, when my wife and I are growing older and our children are beginning to pursue their own lives, I have been searching for a way to both adjust to and gain greater self-understanding and depth of the feelings that are emerging.” – New York. “Traditional psychotherapy seemed no longer to be the answer. Instead, Peter Strong has helped me to find new avenues, new paths and new awareness of feelings that run very deep and, in many cases, have been long dormant until re-awakened in this fascinating and energizing way. Peter is kind, understanding and a skilled guide in leading me along my personal journeys. He has introduced me to true and effective methods of mindfulness therapy, i.e. recognizing the thoughts and feelings that enter my consciousness, welcoming them and forming relationships with them, becoming aware of all of their sensory and visceral qualities and, in so doing, reaching resolution with all their positive and negative characteristics. His presence on the other side of my computer screen is very helpful but not at all overbearing, allowing me freedom in my own discovery process. I unreservedly recommend engaging Peter’s services in, what has been for me, an extremely effective method of learning about my inner self in ways that I’ve never been able to achieve before.” – New York, USA. “Before my sessions with Dr Peter Strong, I suffered from depression. No matter what I tried, I got nowhere. It was like running around in a circle, I felt trapped. In the first session, I found out my main problem; resisting and avoiding emotions. A few sessions later, I clearly noticed the difference in me. By mindfully accepting negative feelings, they are released and eventually replaced by positive ones. I am a happier person now and have achieved much more in life. Enjoying life to the fullest! 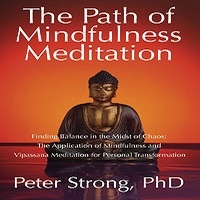 Peter Strong, PhD is a Registered Psychotherapist, Online Therapist, Spiritual Teacher and Author, based in Boulder, Colorado. Peter developed a system of psychotherapy called Mindfulness Therapy for healing the root cause of Anxiety, Panic Attacks, Depression, Traumatic Stress and Emotional Suffering. I can’t write enough how grateful ,I am that I had a chance to learn how to take control of my overwhelming OCD symptoms under the guidance of Peter. Let me begin by saying that my flareups is something that I was unsuccessfully dealing with for good 10 years of my life. My OCD was like a bully, it seemed like it always found the thing that would frighten me the most and just grasp onto it for weeks. Completely taking me away from my family, friends and everything I did and enjoyed. It went from me being unreasonably jealous and insecure in my relationships to health scares to harm thoughts to feelings that I was becoming psychotic and the last and most debilitating one – a fear of losing control and self harming. I had dozens of compulsions without realizing, my attention, short term memory and focus were nearly gone. For about 2 weeks before the initial session I felt depersonalized, derealized and anxious the whole time. My intrusive thoughts would preoccupy me for 95% of the time and I just felt like this time I really had to learn how to either control my emotions and not live inside my thoughts or go into the hospital and ask to be put on medication. Let me also add that never in my life would I consider “meditating” on my intrusive thoughts. After just three sessions with Peter my OCD’s strength was cut in half, and then a few more sessions – it no longer had control over me. Even if intrusive thoughts came back they did not cause any or very little anxiety. My sleep got 1000% better, appetite came back. With that being said I feel like I finally realized how to connect with my true self, became more social, emotionally available, friendly, compassionate, composed and just aware of my body and my feelings so much more than I ever did. The things that would make me upset, seem like such a non-significance now. I know that there are still going to be many great and bad days going forward but knowing the practice of Mindful Meditation I am no longer anxiously waiting for my OCD to flare up. I will be always grateful that I found out about Peter Strong and Mindful Meditation and will recommend his therapies to everyone who is going through tough times.